Many people enjoy owning a large dog breed, especially if they live in the suburbs or a rural area. Large breeds generally need plenty of room to exercise and they like to run and play. Some large breeds, such as the Sporting breeds, need room to run. Although they are not the best apartment dogs, they can adapt if the owner is diligent about walking their dog and taking them to dog parks to run. But, large breeds are usually happiest when they have more freedom. According to the American Kennel Club, registration numbers for large breed dogs have been declining in the last few decades as more people choose to own small dogs and medium-sized dogs. However, the Labrador Retriever still sits atop the registration statistics with the number one ranking in the United States, followed by the German Shepherd. The tiny Yorkshire Terrier has nosed out the third spot, but he is closely followed by another large dog and one of America’s favorite breeds — the Golden Retriever. There are many pros to living with a large dog, provided you have the room and space for the dog. Large dog breeds are well-suited to suburban or country living. They can make good watchdogs or even guard dogs, with the right temperament. Many of the most popular large breeds make good family dogs, such as the Labrador Retriever and the Golden Retriever. They are good with children, patient and playful dogs. Many large breeds are known for having even temperaments. Some large dogs are protective of their families and especially of children. In spite of their size, many large dog breeds can adapt and make good apartment dogs. If they get enough exercise, a large dog is often happy to relax and sleep the rest of the day. For example, retired Greyhound dogs can adapt well to apartments as long as they get a good run regularly. They are very calm in the home. The same is true of many large dog breeds. Most of them are relatively calm inside the house. They save their energy for outdoors and prefer to relax all day. Many large breeds also have a special fondness for furniture and love to nap on sofas and beds whenever they can. 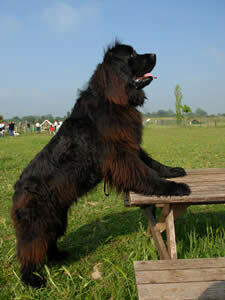 Many large breeds are very good at dog training. Some of the smartest, most trainable of all dogs fall into this size category. They are often eager to please and enjoy learning. As with all dogs, if you are interested in getting a large dog breed you should do your homework on the breed to make sure it will suit your particular lifestyle. There are many temperaments, activity levels, grooming requirements and other differences among large breeds, so make sure that the dog you’re interested in suits you. There are also a number of cons involved with living with a large dog. It does cost more to keep and maintain a large dog. Food costs more. Veterinary care costs more. Even dog toys cost more. However, in most cases the cost of purchasing a large breed dog or puppy will be much less than buying a small dog breed. Large dogs and large breed puppies are more plentiful than small dogs. Large dogs often have larger litters and there are fewer problems with whelping. The popular large breeds and mixes are also easier to find in animal shelters, though it will always be hard to find the rarer breeds. It also costs more to travel with large dog breeds. If you intend to fly with your large dog he will have to fly as baggage, which costs much more than flying with an in-cabin pet. Many hotels and motels also refuse to accept pets that weigh more than 30 pounds. Make sure to check the pet policy of any hotel or motel where you plan to say to see if your dog is welcome. Large dogs typically have a shorter lifespan than small dog breeds, living between 10-14 years. Their lifespan will vary, depending on the particular breed, so check the health and lifespan for each breed to find out what to expect. In general, the larger the dog, the shorter the lifespan, though there are exceptions. As with all dogs, large breeds can have some behavior problems. 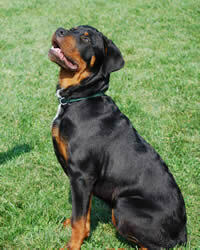 Large dogs, such as the Sporting breeds, tend to chew on things, especially as puppies. Retrievers may drive you crazy bringing you objects to throw for them.